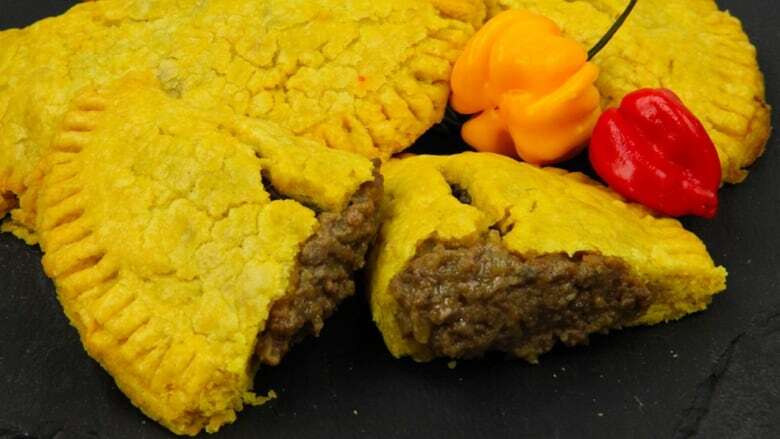 If you like savoury, spice and everything nice, try out Shahir’s spin on Jamaican Beef Patties, made with pie crust! Place the chilled flour, salt, turmeric and sugar in the bowl of a food processor fitted with a steel blade and pulse a few times to combine. Add the butter and shortening. Pulse 8 to 12 times, until the butter is the size of peas. With the machine running, pour the ice water down the feed tube and pulse the machine until the dough begins to form a ball. Dump out on a floured board and divide in half. Roll dough into 2 balls. Wrap in plastic wrap and refrigerate for at least 30 minutes, or overnight. Take the dough out of the fridge 30 minutes before rolling to soften. Roll each piece on a well-floured board into a circle, rolling from the center to the edge, turning and flouring the dough to make sure it doesn't stick to the board. Bake according to recipe recommendation. Brown beef in a large saute pan over medium heat, using a wooden spoon to break the meat into small pieces. Add the onion, pepper and garlic. Continue cooking until the vegetables have softened, 5-6 minutes. Add the beef broth, Worcestershire sauce, spices, bay leaves and thyme. Stir to combine, reduce heat to low and simmer until most of the liquid has evaporated, 15-20 minutes. Remove from heat and stir in breadcrumbs. Adjust seasoning as required. Cool filling to room temperature. Preheat oven to 375F. On a floured surface, roll out turmeric pie crust to ⅛" thick. Using a cookie cutter or the rim of a bowl, cut the dough into 6" circles. Place 2 tbsp of cooled filling onto each round of dough. Brush edges of dough with egg wash. Fold dough over filling to make a half moon shape. Press edge with tines of fork to seal. Place patties on a parchment lined baking sheet and bake until crust is golden brown and cooked through, about 25 minutes. Serve warm.